When you’re a scion of one of Singapore’s wealthiest families, perhaps you’d think nothing about driving under the influence. For his third drink driving conviction, Howard Shaw of the prominent Shaw family was sentenced to eight weeks in prison and a $10,000 fine.The 46-year-old pleaded guilty to drunk driving in the wee hours of Jan 31 along Whitley Road with more than double the legal amount of alcohol in his blood, Channel NewsAsia reports. Along with the hefty fine and jail time, the grandson of Shaw cinemas founder, Runme Shaw, also received an eight-year ban from driving.The penalties aren’t new to the man, really. In 1997, he was slapped with a $3,000 fine and a two-year driving ban; while in 2006, Shaw was jailed for a week, fined $8,000, and disqualified from driving for four years. WAGONER — A former Wagoner County prosecutor has been given a deferred sentence after pleading no contest to a February incident in which authorities allege he backed his vehicle into a neighbor while under the influence of alcohol and drove away. Eric Jordan was handed a one-year sentence for driving under the influence and a one-year sentence for a DUI personal injury accident, according to a plea agreement dated May 12. The sentences, to be served concurrently, were deferred in favor of inpatient treatment. Jordan also must pay restitution, which will be determined at a later date, according to court documents. Jordan served as a Wagoner County assistant district attorney until he was fired in February after the incident. Wagoner County First Assistant District Attorney Jack Thorp previously has said the person who was struck by Jordan declined medical treatment. Jordan was driving was driving a 2014 Ford F-250 at the time of the incident in the Whitehorn Cove area of Wagoner County. Oklahoma Highway Patrol troopers took a report and arrested Jordan, booking him into the Wagoner city jail on Feb. 3. He was charged March 21. Prosecution of Jordan’s case was handled by the Muskogee County District Attorney’s Office. He got the message, but apparently only once it was too late. Police in northwest Florida say they charged a man with Driving Under the Influence after he crashed his car into a sheriff’s office vehicle that was being used to warn motorists against drink driving. Citrus County Sheriff’s Office said Paul Wilkins, 63, struck the cones at a traffic control point in Crystal River at 10 p.m. Saturday night. He then slammed his car into a patrol car, pushing it 30 feet into another cruiser which was emblazoned with the slogan “a cop or a cab, you decide” ― the rear of which was made to look like a taxi. “The irony!” the office wrote on Facebook. Florida Highway Patrol officers arrested Wilkins. Deputies later transported him in the same anti-DUI vehicle to Citrus County Detention Facility. NEWTON, MA — There’s no doubt local police have to deal with a lot of different types of people and calls, including some very serious and sad ones. But a call that came into the Taunton Police yesterday about a unique car crash had them shaking their heads in disbelief as one twist lead to the next. No one was seriously injured, but it did lead to one arrest, one confiscation of a bearded lizard and one gun scare; so they posted about it on Facebook. “It almost sounds like a comedy skit,” wrote one person in a comment under the post. When Taunton Police arrived at the crash they saw a woman standing next to a 1999 Mercedes C280 tucked into some trees on a front lawn and a man in the driver seat attempting to get it back on the road. “That may have been possible if all four tires hadn’t been flattened in the crash, if all the airbags hadn’t deployed and both bumpers hadn’t been ripped off,” said police on Facebook, one of a couple jabs they took at the situation. When officers approached the woman, Amy Rebello-McCarthy, 39, of Newton, she began laughing. Police said she was slurring her words and at times drooling. But she asked them to call a tow truck to pull the car to the roadway so they could be on their way. “Sorry Amy, we can’t move the car right now. If we do, what will you use to hold yourself up?,” wrote police. Officers also spoke to the man who had been trying to get the car out from the trees. He couldn’t remember his name, and was also slurring, was smoking near the car, which was leaking gas by this time, and an officer noticed he had what appeared to be a semi-automatic weapon tucked in the rear of his waistband. “Let’s recap for just a moment!! Two very intoxicated people in a car crash, neither of them coherent, unsteady on their feet, slurring and drooling. If that’s not a bad start, let’s throw the gun into the equation,” police vented on Facebook. Police arrested Amy Rebello-McCarthy and charged her with operating a motor vehicle under the influence of liquor, driving to endanger and a marked lane violation. But before she was arrested she let police know she had a Bearded Dragon Lizard – in her bra. “The Bearded Dragon Lizard was transferred to the Taunton Police Department and turned over to the Animal Control Officer. It faces no charges at this time,” wrote police. End Scene. A judge orders the police officer who prompted a gun scare at a local theater to immediately be taken straight to jail. Cincinnati sergeant Shauna Lambert will spend the next five days in jail.Lambert’s attorney asked for a stay until Friday so she can wrap up a situation at work. Judge Jason Nagel denied that request.After she serves her jail time, Lambert will spend another 54 days under house arrest with an electronic monitoring device. Lambert pleaded no contest to inducing panic and using weapons while under the influence. 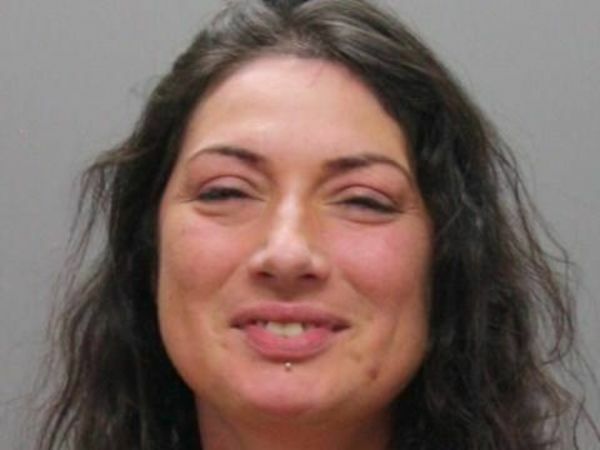 Lambert was intoxicated when she dropped her weapon at the Rave Movie Theater in Milford. Nobody was hurt.She apologized at her hearing and said she took full responsibility for her behavior. She had a previous OVI arrest before this incident and said she was getting help through rehab and continuing care. “I want to help myself, I don’t want to be like that.”As part of the plea, Lambert had explained that she had taken the gun with her to the theater out of concern for her safety, after there had been a shooting at an airport in Florida.Judge Nagel told her that’s not why she was there. She had decided to drink alcohol and not properly secure her weapons. “You’re a police officer. A waistband is not a way to have a loaded weapon secured. It’s one of the main reasons why that weapon ultimately fell on the floor and was grabbed by another patron of the movie theater.”Lambert will also serve two years probation and serve 80 hours of community service. Judge Nagel told her if she violated her probation she would serve all 180 days in jail.Lambert has been on desk duty since her arrest and her police powers remain suspended. She will undergo the department’s disciplinary process. Judge Nagel did not order her to give up her weapons.She is banned from consuming alcohol or illegal drugs and going to bars. She’s been ordered to stay away from the Milford Rave Cinema. A pizza delivery driver is accused of driving drunk in the city of Oconomowoc.Police arrested the driver after he crashed his SUV. We’re told the driver was out delivering pizzas when he veered off the road and ran over a utility pole. When police arrived, he told them he had not been drinking. His blood alcohol content, however, said otherwise.What started out as a Saturday night pizza delivery ended less than a mile from Rosati’s Pizza as a 21-year-old delivery driver smashed into a utility pole near Oconomowoc High School.When police arrived on the scene, they say the driver’s “speech was slightly slurred and his eyes were bloodshot.”A police report says the man initially told officers he had not been drinking but later admitted to drinking “at some point earlier in the day.” His blood alcohol content clocked in at .108, well above the legal limit. That driver was arrested but has not been charged so we are not naming him. So, how long had this driver been drunk on the job? The owner of Rosati’s Pizza did not want to comment but told us that the driver has been fired from his job at the restaurant.Because this is that driver’s first OWI, he’s only receiving a citation and a $1,000 ticket.We went to his house this afternoon where his mother told us they have no comment on the incident. A Seattle mother was arrested for driving under the influence and assaulting a police officer, according to the Portland Police Bureau. Police said on May 15, they received a report of a vehicle with flat tires weaving in and out of traffic and scraping the jersey barrier on Interstate 5 near Jantzen Beach in Portland. A judge apologized to Rachel Winter on Tuesday as he dismissed a drunken driving charge lodged against her by the Niagara County Sheriff’s Office after an internal process that Winter’s father, a prominent Niagara County attorney, said was politically motivated.Winter, 21, was pulled over by Deputy Timothy Caughel in Lockport Nov. 24, and Caughel wanted to charge her with driving while intoxicated and reckless driving.Undersheriff Michael J. Filicetti said last month that the DWI charge was not brought at the time because Caughel’s supervisor that night, Lt. Steve Broderick, was doing a favor for Winter’s father, Ronald J. Winter, a former assistant Niagara County district attorney. Filicetti said the ex-prosecutor came to Sheriff’s Headquarters that night and talked to Broderick.Broderick, who is also Town of Lewiston supervisor, was the subject of an undisclosed internal administrative action, as was his commander that night, Capt. Jill Herrington.”Persons in the Sheriff’s Department viewed Steve Broderick as a potential candidate for sheriff and sought to discredit him, and used this case to do it,” charged Ronald Winter, the law clerk to State Supreme Court Justice Richard C. Kloch Sr.Broderick, who said he couldn’t comment, is a Republican whose family has long been prominent in politics. Sheriff James R. Voutour, whose term runs through 2020, is a Democrat.”The assertion that this was done to discredit Lt. Broderick is absurd,” Voutour said. “The actions of (the Niagara County Sheriff’s Office) were to do the right thing when no one else would. That is what the public expects.””I feel we did the right thing. I have no control over what the court does,” Filicetti said. “I’d rather get faulted for doing my job rather than be accused of covering something up.””I never asked for a favor, and certainly my daughter didn’t,” Ronald Winter said. “My daughter and I are going to explore what options we have as far as recourse.”The Sheriff’s Office added the DWI charge against Rachel Winter March 5, but Niagara Falls City Judge Robert P. Merino threw it out Tuesday, along with the reckless driving charge, finding the evidence of each was legally insufficient.Rachel Winter then pleaded guilty to failure to keep right and an equipment violation. She was granted a conditional discharge and was not fined, although Merino had to impose state-mandated surcharges totaling $146.”The court issued an apology to my client on behalf of the justice system,” defense attorney Theresa L. Prezioso said.Orleans County District Attorney Joseph V. Cardone didn’t fight Prezioso’s dismissal motion. He could not be reached for comment Tuesday.Cardone was named special prosecutor after Niagara County District Attorney Caroline A. Wojtaszek, a former colleague of Ronald Winter, recused herself. Merino ended up with the case after city judges in Lockport and North Tonawanda also recused themselves because of their connections to Ronald Winter. ROCKY RIVER, Ohio — A convenience store employee was hurt when a man naked from the waist down intentionally crashed his car into the store to get beer, police say. The crash happened just after 1 a.m. Sunday at SDM Food Market on Hilliard Boulevard just west of Wooster Road, police say. A deli counter separated a 49-year-old employee from the car, but he still suffered injuries to his legs and chest, Rocky River Police Chief Kelly Stillman said. Officers found the employee covered with debris when they came to investigate. He was taken to Fairview Hospital. Robert Mason, 45, was charged with operating a vehicle while under the influence alcohol or drugs. He was taken to the same hospital after suffering injuries from the crash. The employee just closed the business when a car came crashing through the wall, he told police. Mason told the employee he needed beer, the employee reported. Mason barricaded himself in the beer cooler and told police to shoot him, Stillman said. He could be heard yelling in the body camera video. Police used a Taser to subdue him and he was taken into custody. Rocky River Municipal Court records do not say when Mason will make his first appearance.